Degnan Design Builders, Inc.: How should you build your walls - balancing cost and efficiency? How should you build your walls - balancing cost and efficiency? A former employee of mine, Nick Thompson (who is also my cousin) recently asked me a question about how we build our walls now, compared to the early 2000's when he worked for me. For most of this decade we followed the principles of the Intelligent Wall method. Nick observed that on arecent project, we changed our methodology somewhat. We did this for specific reasons. Here are the details. Nick asks, "Reading different stuff, some from your Facebook page, and comparing to what I thought I knew and what we did when I worked for Degnan Design Builders, Inc. Why is house wrap over foam not redundant? I always thought builders who put house wrap over foam were throwing money away." The fact is, Nick - it is redundant, in a way. But as we've done some projects in the last 3 years we found reasons why to use Housewrap in addition to foam. 1) We found out how much foam shrinks over time. In 2007 we remodeled a home where my dad had done an addition in 1987 with 2x6 walls and 1" foam sheathing. When we re-sided, we found that all the seams in the foam had been taped. But, the foam shrunk and the tape broke loose, leaving some gaps and air infiltration. The housewrap will prevent that from happening. 2) On the big house in Pewaukee, we were intentionally redundant. We had a lot of stucco for the finish on that house, and we wanted a bond-break between the foam and the OSB wall sheathing. That house was fully sheathed in OSB, then it has housewrap over it, then it had foam, then the masonry or stucco finish. The stucco wire lath was fastened over the foam, and the stucco will adhere to the foam. The housewrap created a bond break to allow the stucco and foam to move interdependently (a tiny bit) compared to the structure of the house. This will keep the house energy efficient and air-tight and also it will help prevent cracking of the stucco. 3) So my new general rule is this: There should be 2 layers of "something" and the seams should overlap. -When re-siding a house and adding a layer of foam over existing sheathing, those 2 layers will provide air tightness just by their sandwiching together. Taped seams will suffice for air sealing, and the sandwiched layers of material will provide the backup if there is shrinkage over time. -It is noteworthy that Polyiso foam such as Tuff-R or R-board does not seem to shrink, based on the same 1987 project - Tuff-R on the old house did not shrink, but Styrofoam on the addition did shrink. So, using polyiso might be another solution. -When building a new home, if you are using just foam you should also use housewrap, so that you have a redundant air barrier of the housewrap as the foam may shrink over time. 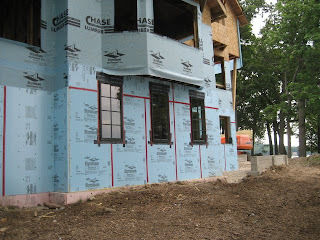 -If you apply OSB to the entire house first, then foam over it, with the seams offset, you should be OK to skip the housewrap in most cases (with vinyl siding or brick, for instance) because the OSB and foam will work together to form a redundant air barrier sandwich. Still, tape the seams during construction, as maybe the foam won't shrink in the future. 4) I also have some possible new methods using spray foam insulation, but that is a whole other story! Condensation on Windows - What's the deal?